Over the last few years, I've made it a priority to travel more. In the past, I had years where I either didn't have the time, didn't have the money, didn't have the interest...and in some years I didn't have all 3! When I went through some major personal and professional life changes in 2014, I made it a priority to see more of the world. About 6 months ago I wrote a bit about the various travel opportunities I've had and how it helps me be better at my job. The year 2016 was a pretty good travel year for me. I started the year out in Cozumel, Mexico for a New Years trip. After a canceled trip to New York City in early February, I made up the trip in late February. In total I went to the east coast 3 times in 2016, adding Vermont and Connecticut to that Feb NYC trip. Of course, I had stops in Nevada (Las Vegas), Washington (Seattle), and a ton of trips to California (San Francisco 15 or so times, San Louis Obispo, Healdsburg, etc). One of my favorite trips of the past couple of years was to Mexico City, where I went in a desire to go somewhere that most others don't. Its an amazing city, with incredible history, culture, food, and people. I'll absolutely be back! Of course, the highlight of my year in travel was 2 weeks in Spain with my girlfriend. I needed to be in Barcelona for work, so she joined me and we took a second week of vacation to explore San Sebastian, Haro, and Madrid. With two trips to Spain in the past 2 years, España is quickly becoming one of my favorite places in the world! 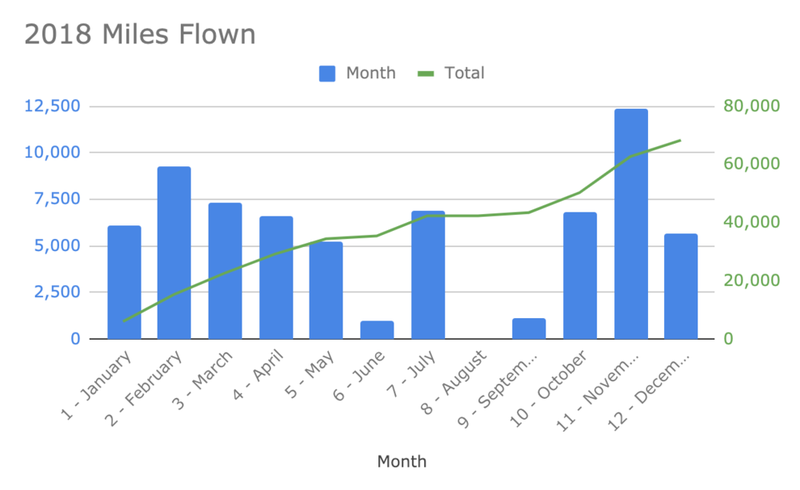 In total, it looks like I flew 48,510 miles in 2016, on exactly 50 flights (segments), which makes my average flight length just 970 miles. A whole lot of 550 mile flights to/from San Francisco will really bring down that average! While nearly 50,000 miles and 50 flights seems like a lot, there were many places I didn't go. In 2016, I had hoped to travel to South America on vacation. I also wish I would have spent time in more states, specifically Illinois, Colorado, Georgia, and Massachusetts. Hopefully 2017 will bring me to these US outposts, and more! We have Hawaii booked for February, are talking about a Europe trip in the summer (France & Italy), and by the end of the year I'd love to work remotely from Argentina for a month. What new and/or exciting locations are you traveling to in 2017? Let me know via Twitter or Facebook!